These patriotic building blocks feature facial renderings and facts about the U.S. Presidents. Learn the building blocks of democracy from dignified blockheads. 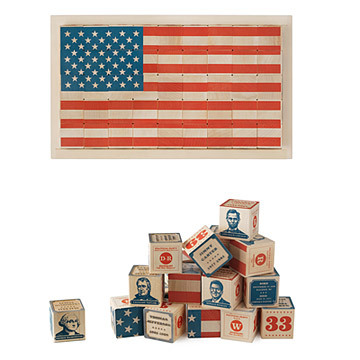 Patriotic cubes with facial renderings of every U.S. President stack neatly into a perfect, forty-five piece set forming a grand American flag on one side. Each cube presents a face, name, nickname, lifespan, party affiliation, term and number in red, gray and blue ink. Click here to see sample blocks image one and image two. We have been giving this to our friends and family as a first birthday gift for their children and we have gotten so many compliments on how much the kids love playing with it and how much the adults do to. LOVE THIS ITEM - It's our go-to for baby gifts! I've purchased this item more than once for baby gifts. It's more than a toy, it's a learning tool, very substantially made, makes a statement even when it's not in use. It's a beautiful item. It's the kind of gift/item someone keeps forever. The blocks was a gift for my son. This completely help both my son and my husband to learn something they both love! history. The only thing I didn't really like was how sharp the edges were. For a 18-month old, he can hurt himself. I'm saving this for my son's birthday. Although he'll be a bit young for it, I think we'll enjoy these blocks and learn from them for years to come! Fantastic item. Well worth the cost! My son plays with these blocks for hours on end. He has learned about all American presidents, their political parties, their nicknames, etc. he loves having his daddy or I mix up the blocks and remove one. Then he goes to work reordering the blocks and determing which block is missing. He's an expert by now, but he still loves the game, one of his own invention. These blocks have given him numerous hours of entertainment, amd we're happy that he's using his time to expand his knowledge of American history. My son is a history buff. I was nervous about giving him this as it was not the typical plastic star wars x fighter model. He was very happy with the gift and unlike most of the other stuff he gets, this looks good when left out on the coffee table. Although the kid didnt quite understand, the parents loved it! Love the blocks! Very nice quality and appear to be durable. Only complaint was there were 2 duplicate blocks (& 2 presidents missing). I contacted the company directly (contact info was on packaging) and am awaiting replacement blocks. They sounded willing to remedy the problem. Will provide update when we see customer service response on missing blocks.